Soak all the ingredients min 4 hours & grind well with seasoning. Allow to ferment upto 8 hours. Take the Appam Kadai, make appam & serve hot. Serve with any kind of Chutneys Or Sambar. Just looks so good ur appam! Appam pakkave azhaga irruku...romba naal achu saapitu...Looks really great!! Nice looking appam. love it with traditional accompaniments like stew, egg masala, channa, or chicken curry. 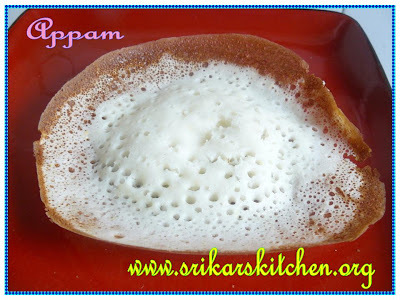 lovely appams.. i also posted aapam recipe sometime back. i love aapams. Wow the appoù looks so perfect and delicious. I amways thought coconut or coconut milk was added to them. Appam looks soft and spongy. Nice way of presentation. 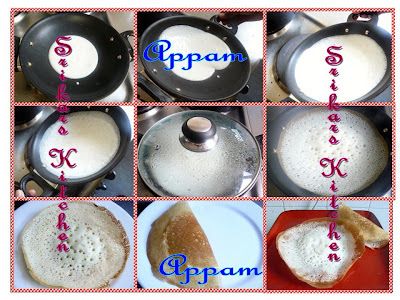 Lovely appam's..Nice presentation srikar..i have appam batter now, iam gonna have it right now! Appam looks lovely and yum ! Appam looks too good! This is perfect! I love appam. My grandma used to make her grandchildren pound rice to make flour for the appam. Those were the days! Thanks for sharing and bringing back my childhood memories. Long since I had appam. Havent tried it here though.. The appams look great...have been planning to make appam for a while now however havent really got down to it. But adding urad dal is a new version of the appam . Have been making it with raw rice, cooked rice and coconut for so long. This is one worth trying ur appams look delicious. I've never had appam but that looks perfect. Looks perfect. I love my mom preparation.... awesome dish. never tried doing it without the aappam satti; has come out well. new recipe to me. looks yummy.. should try sometime.